Focusing on your short game around the green is one key way to lower your golf score. Lowering your score on the golf course can take a variety of improvements on the links. From slowing your swing to using golf equipment to managing the golf course and playing it safe, you're giving yourself the opportunity to save a handful of strokes. Playing smart while utilizing proper golf technique may help you lower your scores and your handicap. Patience and understanding course layout also may help determine whether you finish with a round filled with bogeys or pars. Hit the big part of the green. Many golfers will try to shoot directly for the pin but don't realize the layout of the green around the pin, which may cause the ball to roll off of the green. Golfers can place it safe or go for the pin. Unless you're within 50 yards and a short pitch away, try to hit the ball in the middle of the green for a reasonable putting distance remaining. This will allow for a two-putt and to save multiple strokes by missing the green on the approach shot. Monitor your tempo on the golf course. It will help you not to mishit by speeding up your shot. Develop consistent tempo for every club, from driver to sand wedge. 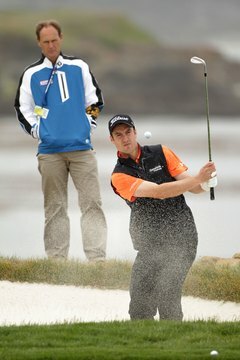 By creating similar tempo for all clubs you're more likely to hit straight shots and avoid trouble, saving a few shots. Leave the driver in the bag. Manage your game by hitting a club that will set up your next shop. Think about the second shot before you hit your tee shot. For example, if you're hitting a par 4 350-yard tee shot, consider using a long iron or 3-wood off of the tee as it may be better to lay up 150 yards out. By laying up, you may avoid losing control on a long drive, heading in to the woods. Or you may hit long but end up in a bunker or in the water. Utilize golf equipment. Wear golf shoes and use a golf club. By wearing golf shoes, you're providing a stable stance through your swing, staying balanced. By keeping a good stance, you will keep the ball in play and save a few strokes. Wear a golf glove to give you a tight grip on the club. Maintaining a tight grip will help to keep your club going straight through the shot while keeping the ball in the fairway and out of trouble.